Bartercard enables a community of businesses to exchange their goods and services with each other, which brings them more customers and saves them cash. Bartercard facilitates and monitors sales (credits) and purchases (debits) undertaken by members. These transactions are recorded electronically and its members receive a monthly statement that summarises their transactions. Members can transact using Eftpos, Manual Vouchers, and Online Transactions and even with the latest Bartercard App for Apple, Android and Windows phones. In addition, Bartercard promotes member businesses to generate New Customers and maintains a business directory in which members are listed. Bartercard is a wholly owned New Zealand company that has been in operation since 1992 and has experienced directors and management that have held positions across many different industries and sectors. When you trade your goods/services for goods/services you need, you are creating a sale and effectively buying at your own cost of goods. To put it simply, if a business owner had a choice to pay for an expense worth $1,000 he is much better off providing a gift voucher from his business than paying cash for a $1,000, because a profit margin is built into the gift voucher. 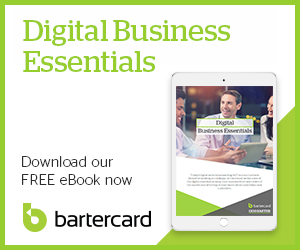 What businesses does Bartercard work for? Bartercard can work for any business that has the capacity to take on additional customers. There are many case studies and trading tips available for members to study to see how Bartercard can work for them. Check out our testimonials to hear from other members. What type of businesses are part of Bartercard? Bartercard New Zealand has over 6,000 members and is represented by over 16,000 cardholders. There are over 650 categories of business, everything from Accommodation to Zoos. Bartercard welcomes many industries and businesses. To see if we can help your business, please make an enquiry here. What can I sell through Bartercard? You can sell almost anything through Bartercard. Besides your own products and services there is nothing stopping you from selling something from home or even buying from a manufacturer, importer or wholesaler. Your trading is only limited to the efforts you are willing to put in to be successful. How can I use Bartercard? There are many different ways to use Bartercard to build your business and improve your lifestyle. Upon joining you will be allocated a dedicated Trade Broker (personalised Account Manager) who will be available for you to discuss the many options that best suit your business and lifestyle needs. You can get a sense of how some members use Bartercard by clicking on ‘Member Reviews’. As a member you will also get access to many video tutorials and case studies on unique and creative ways to solve common business challenges using Bartercard. What is a Trade Dollar? A Trade Dollar is the electronic trading currency Bartercard members use to transact with. For accounting, GST and Income Tax purposes, One Trade Dollar (T$1) is equivalent to One New Zealand Dollar (NZ$1). Does Bartercard offer Interest-Free Lines of credit? Yes – as part of your Bartercard membership you will have access to an interest-free line of credit. You can use this interest-free line of credit to purchase goods and services, assets or property for your business, lifestyle or to help grow your wealth. Standard credit criteria will apply. Can I use Bartercard for personal purchases? Yes, if you derive your income from your business to pay for your personal expenses. By using Bartercard and spending your Trade Dollars on these personal expenses you will save your cash. You can draw Bartercard Trade Dollars as a director’s dividends, drawings or a loan. There is further explanation of this on how to incorporate Trade Dollars into your payroll system in our creative business tips available for members. However, we always suggest members speak to their accountants or specialist tax advisors regarding how best to implement these strategies into their business. Yes, you can limit the amount of trading you do. Bartercard members usually trade up to 10% to 15% of their total business turnover. We understand there are times when you may be operating at full capacity for a period or seasonally at your peak. Working with your Trade Broker (personal Account Manager) you work out a plan for the amount of trading that best suits you and your business. You can start slowly and as you work with us to bring on more suppliers of your choice, we can increase the amount of new Bartercard Customers you take on. What if none of my suppliers are in Bartercard? When you join, a comprehensive business analysis is conducted with the view to identify potential suppliers already available in the 6,000 strong business network. If there are insufficient suppliers available to suit your business requirements then Bartercard will work with you to bring in additional new suppliers to satisfy your needs. Many of Bartercard’s top trading members have successfully improved their business profitability by being proactive in their recommendation and referral of new suppliers to provide them with the products and services they need to run a successful business. How do I convert my Trade Dollars into cash? By purchasing products or services with your Trade Dollars, you have already saved cash and kept that cash in your business. You can also buy items with your Bartercard Trade Dollars and then sell them for cash, therefore converting Trade Dollars to cash. For example, a restaurant purchases wine on Bartercard and then sells within the restaurant for cash. Trade Dollars are not transferable for Cash by Bartercard or any other Financial Institution. Can I charge Part Cash and Part Bartercard? Bartercard is a 100% Trading Exchange. Upon joining every member agrees to trade at 100% full barter. There are practical exceptions to this rule. Bartercard rules allow for Real Estate transactions to be conducted with a minimum of 20% barter component and continuous cash/barter supply agreements and large transactions can be negotiated only with prior written approval of Bartercard NZ. Yes, Bartercard hosts over 100 local and national networking functions a year. Each member is encouraged to participate in these functions in order to network themselves with other members and promote their own business. It is a great way to build up your contact base of Bartercard Members to increase your ability to save cash and generate new customers. To find out where and when the next event is in your local area give us a call – Contact us. What is the tax treatment for barter transactions? Barter transactions are assessable and deductible for income tax purposes to the same extent as other cash or credit transactions. Therefore, the advantages and disadvantages are similar to normal cash revenue or expenses. When an entity that is a member of a trade exchange makes a taxable supply to another member there is a tax liability, including goods and services tax (GST). GST is paid and received by members in Trade Dollars. For the purposes of the tax laws, payments such as GST and income tax must be remitted to the IRD in New Zealand currency. Please consult your accountant for further advice. Is a tax invoice required for barter transactions? Yes, a tax invoice is required for a barter transaction as it is for any other business transaction. Where a member makes a taxable supply and the consideration is expressed in Trade Dollars, the tax invoice must comply with all of the usual requirements for a tax invoice. We suggest you consult your accountant to discuss this. Simply call 0800 New Customers (0508 639 287), or click here to fill out your contact details and a member of our team will be in touch will you soon. We welcome a no obligation, free consultation with you first to determine your needs and identify the level of membership that best suits your business.